More than two dozen Middleboro Girl Scouts, joined by troop volunteers and parents, recently gathered at a local Girl Scout House to give back. 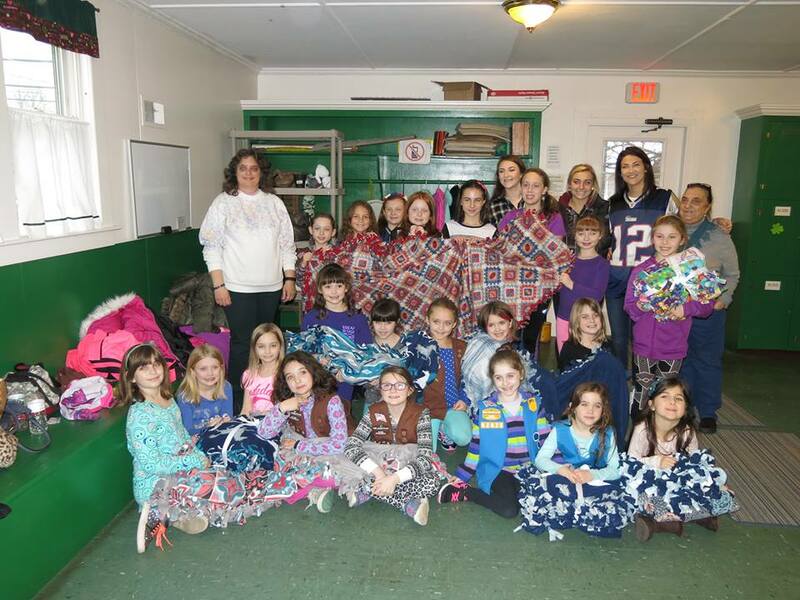 The girls worked with Annie’s Kindness Blankets, and over the span of a few hours, the Middleboro Girl Scouts created 16 blankets. Annie’s Kindness Blankets honors Annie Marie Varney, a mother of three daughters, who passed away in 2015. Annie was known for her laughter, love and kindness, and her family created Annie’s Kindness Blankets in her honor, with a mission to deliver hundreds of homemade blankets to local hospitals for any children who needs extra comfort (“a warm hug”) during their stay. Daisy troop leader Leslie Murphy says, “The event presented a great opportunity for [the girls] to truly see how Daisies and Girl Scouts can help to make the world a better place by volunteering their time and talent for others.” She also appreciated the opportunity for the Daisy Girl Scouts to interact and work with the older Girl Scouts in the community. Members of Annie’s family visited the girls, and treated them to cupcakes. Middleboro is currently forming a few Daisy Troop with girls in Kindergarten and first grade. If interested in joining this troop or volunteering, please visit gsema.org or call 844-306-GSEM (4736).